Posts Tagged "Internet Explorer Enhanced Security Mode"
2. 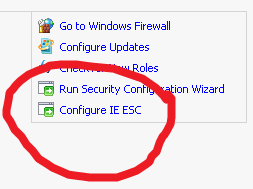 Click on Configure IE ESC under Security Information. 3. Turn IE SEC on/off for administrators and/or users.